The Canadian Book Market 2018 is now ready for purchase! This annual publication reports on sales value, sales volume, and number of ISBNs with print sales in the Canadian trade market in 2018. It also breaks down top-selling titles, pricing, and the share of the total market for more than 50 categories, including Science Fiction, Poetry, Architecture, and others. 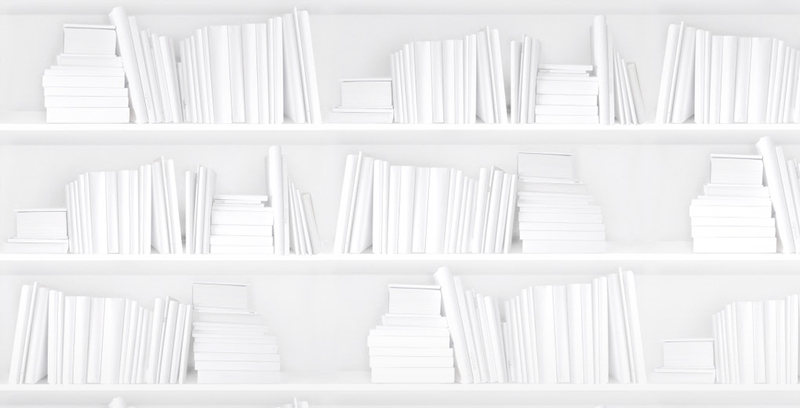 In 2018, in the Canadian English-language print trade market, we tracked sales for 867,000 unique ISBNs, which amounted to 54 million books sold at a value of $1.1 billion. But the data doesn't stop there! 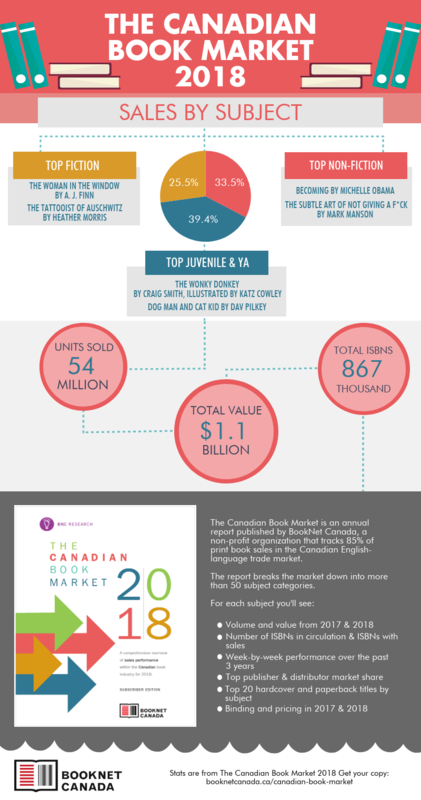 For each of the stats above, The Canadian Book Market will show you how the 2018 data compares with the data for 2017. We also started, last year, to include some top-level data from our Canadian Book Consumer survey panel on formats and other buying trends. It's a fantastic resource for publishers, booksellers, librarians, authors, and anyone interested or involved in the Canadian book industry. Also, included in this report for the first time this year is some high-level French Canadian information from the Société de gestion de la Banque de titres de langue française (BTLF) — a not-for-profit organization that brings publishing professionals together and acts as a hub for integrating technology into the French-language book supply chain in Canada. We've compiled some highlights in the infographic below (scroll down for the text version of these stats). But to get the whole picture of the Canadian book market, be sure to purchase your copy! How many books were sold in 2018 in Canada? In 2018, in the Canadian English-language print trade market, we tracked sales for 867,000 unique ISBNs, which amounted to 54 million books sold at a value of $1.1 billion. This is fairly flat from the year before (when comparing amongst a subset of comparable stores that report consistently to BNC SalesData every year): the value sold in 2018 is down a very slight 0.2% from 2017 and the volume sold is down 1.9%. Juvenile and YA books accounted for the majority of those sales, 39.4%, while Non-Fiction titles made up 33.5% and Fiction made up 25.5%. The top-selling title was in the Non-Fiction category: Michelle Obama's memoir, Becoming, was the bestselling book of the year even though it only had seven weeks of sales in 2018. The top-selling book from a Canadian-owned publisher was the cookbook Yum and Yummer by Greta Podleski. The top two Juvenile & YA titles were The Wonky Donkey by Craig Smith, illustrated by Katz Cowley and Dog Man and Cat Kid by Dav Pilkey. The top two Non-Fiction titles were Becoming by Michelle Obama and The Subtle Art of Not Giving a F*ck by Mark Manson. The top two Fiction titles were The Woman in the Window by A. J. Finn and The Tattooist of Auschwitz by Heather Morris. As mentioned above, The Canadian Book Market 2018 is the first edition of this publication to have information for the Canadian French-language trade market. We found that in the French Canadian market, as in the English market, two out of every five print books were Juvenile or YA titles. The top-selling French Juvenile title was L'agent Jean!, an instalment in the L'ADN de l'impossible series. Fiction unit sales in the Asian American sub-genre grew 384% thanks to Kevin Kwan's Crazy Rich Asians and the movie based on the book that was released in theatres in August 2018. The Political Science category saw an 87.5% increase in unit sales between 2017 and 2018, with titles like Fear by Bob Woodward and Fire and Fury by Michael Wolff topping that list. The House & Home category increased 57.9% from 2017 to 2018 thanks to Joanna Gaines (Homebody: A Guide to Creating Spaces You Never Want to Leave) and Marie Kondo (The Life-Changing Magic of Tidying Up).